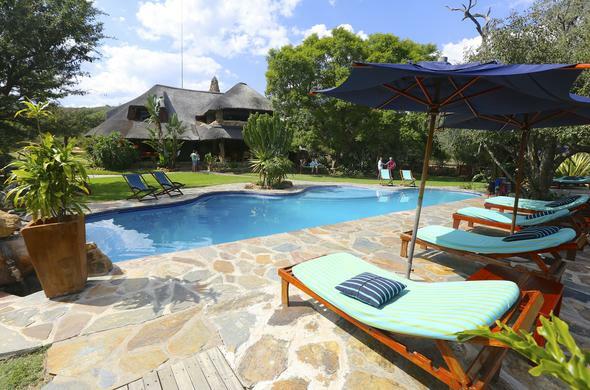 Ant's Nest is the ideal retreat in which to enjoy being with friends or family or on honeymoon in a malaria-free area of South Africa. Ant's Nest is Ant and Tessa Baber's unique bush home situated on a private game reserve in the Waterberg, South Africa, and offers a relaxed atmosphere. With wildlife frequently visiting the watering hole, guests can enjoy private game viewing from their private verandah. The personal service and flexibility keeps everyone entertained, from the youngest to the oldest, or the fittest to those most in need of a rest. Ant has spent his whole life in the Waterberg. As a descendant of one of the earliest pioneers in the area the heritage of the African bush varies in him. A passionate conservationist, Ant and his professional guides provide a total bush experience by sharing their knowledge of the wilds. Tessa, with her influence from Kenya, has brought to the colonial home a stylish warmth in her use of classic furniture fashioned from local timber, fabrics and stone. Make yourself at home in an atmosphere of relaxation and tranquility. You will be well taken care of and personally hosted by the friendly team at Ant's Nest.